Wisconsin Gov. Scott Walker is set to formally announce his presidential campaign on Monday in Waukesha, making him the 15th Republican candidate to enter the race. Just like many of the White House contenders who have announced lately, it has been clear that Walker has been running for the better part of the year. Here’s what we’ve learned about him from the decisions he’s made so far. Given the spectacular size of the GOP field, there was no guarantee Walker would be a co-front-runner by now. Many observers heading into 2015 were skeptical of his ability to command a crowd – he’s not known for his charisma, and it was only last cycle that Tim Pawlenty’s plain Midwestern style proved a dud with GOP voters despite his solid credentials. Walker put those concerns to bed with a breakout speech at the conservative Freedom Summit in Iowa, the first major candidate showcase in the crucial caucus state. He wowed the crowd with a dramatic retelling of his battle to curb bargaining rights for public sector unions, which set off mass protests and led to a failed recall attempt. He played up his blue-collar roots, getting laughs with an anecdote about shopping for bargain-bin sweaters at Kohl’s. The speech was a signal he was a force to be reckoned with, and his poll numbers shot up immediately afterward. Walker’s nomination strategy starts and ends with Iowa, where he hopes his family roots (he was partly raised in Iowa) and social conservatism will match up with the state’s evangelical-leaning Republican base. The strongest case for Walker among Republicans is his tenure in Wisconsin, a blue-leaning state where he’s nonetheless survived three elections while passing a raft of conservative legislation. 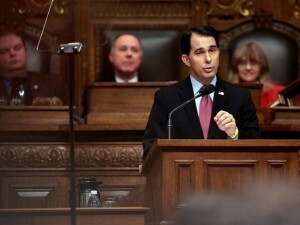 In a party whose base is constantly worried that its leaders are about to sell them out, Walker can argue with credibility that he’s risked his re-election prospects to score tangible gains on gun rights, labor laws and abortion restrictions. But there are downsides as well. He fell well short of a campaign pledge to create 250,000 jobs in his first term. Even some Republicans in the state are unhappy with his recent budget, citing policy changes unrelated to fiscal issues, steep cuts to education, and an over-reliance on borrowing. Walker’s done a good job separating himself from Bush and Rubio on policy by tacking right and selling himself to Republicans as more electable and accomplished than many of his other dozen plus rivals. But rival campaigns see a number of areas where Walker is vulnerable. It’s usually not a great strategy to accuse a fellow Republican of being too far to the right in a primary, but the way Walker has placated conservatives – especially in Iowa – opens him up to a less ideological accusation: That he twists with the political winds. Perhaps the most important dividing line between Walker and his top-tier rivals is what his strategy says about his general election approach. Depending on who wins the nomination, the GOP’s comeback plan will be very different in the final stretch. Walker by contrast has been moving consistently right on immigration and gay rights alike over the last few months and pledged to keep the marriage issue alive by agitating for a new amendment. Underlying moves like these is an alternate view of the election – one that sees less value in cutting the margins with Democratic-leaning groups and more value in firing up conservative-leaning constituencies, especially blue collar whites.